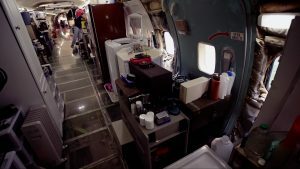 Bruce Campbell’s home is a Boeing 727. We don’t mean to say that he travels so often that he practically lives inside an airplane. 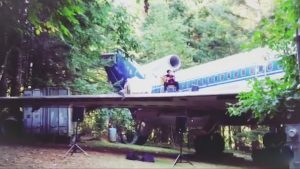 The reason his home is a Boeing 727, is because he bought the airplane when it was retired and had it moved into the woods. 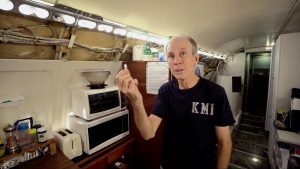 He didn’t do it because he wanted to be different, on the contrary: Bruce believes that retired jetliners have a tremendous potential as superior homes. He has quite a few compelling points in his favor and I guarantee that once you finish this article you will -at least- consider the idea yourself. One thing is certain. Bruce Campbell is not a typical person. After working throughout his life as an electrical engineer, he never considered a mortgage or any sort of loan to buy a home, because he didn’t want to be tied to monthly payments over decades. 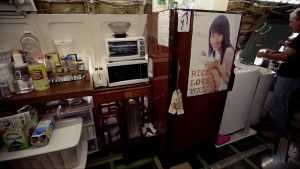 He chose instead, to live very well below his means, in a trailer, determined to become a proper homeowner only when he could afford to buy a house with cash. 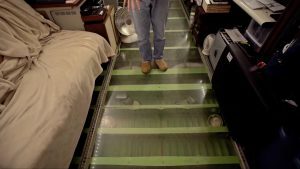 He was drawn to the potential of retired jetliners as homes, when he learnt that they were being retired around the world at a rate of three per day. The logic behind Bruce’s choice is rather simple. Retired jetliners are marvelously designed living spaces that are designed to keep people safe and comfortable at over – paraphrasing Bruce- 900 kilimeters per hour over 11 km high. They have a tremendous potential not only as homes -according to Bruce- but as lifeboats as well. He considers tsunamis and the life-saving capacity of these retired machines and cannot help but wonder why aren’t they used with that purpose. He argues the case of retired Boeing 747 aircrafts with particular passion. These wide-bodied airplanes could become lifeboats for over a thousand people. They’re designed to float over water and they do. He believes they could be stripped of unnecesary weight and most seats and save the life of thousands in the event of a tsunami if they were set on beaches with that purpose in mind. As homes, he sees them as huge living spaces with endless possibilities. Airtight, with their own climate control far superior than anything you could install in a conventional house. Earthquake and tsunami proof, provided they stand on its own landing gear with their suspension intact. Their own electrical systems and plumbing can be adapted easily to anything a modern home can require and because they are airtight they can be kept cleaner than any conventional home. 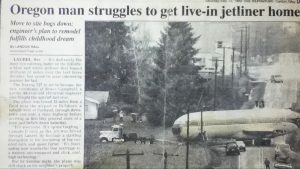 When Bruce was able to afford it he went for it, got himself a retired airliner and had it moved to the piece of land he owned where he lived in his trailer in the woods, back in Oregon. The purchase of the plane was easier than he thought but moving it was not easy. 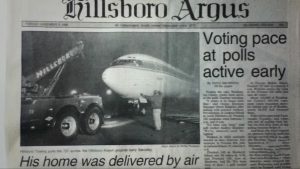 The wings had to be dismantled so Swanson Trucking and Wayne Gripping Construction & House Moving were able to circulate on public roads as they transported the aircraft. Bruce believes “Jetliners are masterful works of aerospance science” and he’s confident that there are no other structures designed as living spaces that can match them. 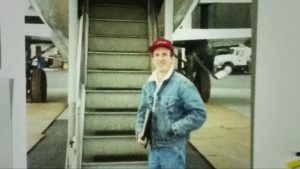 He only laments having bought his own Boeing 727-200 from people who had already removed its engines and other elements prior to his purchase. He plans on buying a bigger airplane in the future and he believes the ideal craft would be a Boeing 747. He believes that the ideal way to go about it would be to purchase it directly from the airline when it’s being retired, supervising the removal of the engines himself and preventing the removal of anything else that might be of use to the airplane as a home. Bruce also believes that favorable terms can be reached with the airline in return for keeping their livelery on display intact and prominently. Entering the plane. No shoes allowed /via YouTube. Bruce wanted the plane to stand on its own legs, that is to say he intended for the plane to support itself on its landing gear, with its tyres and suspension. This would allow the suspension to absorb all the forces of any natural disaster like an Earthquake or a Tsunami. The plane was supported on its “jack points” (places in the fuselage designed to attach hydraulic jacks and lift the airplane for landing gear repairs and other maintenance) as concrete pillars were built beneath the landing gear. One of the alterations Bruce made was replacing the floor with plexiglass pannels. This offers many possibilities should Bruce decide to use the space beneath the passenger cabin. Right now, it allows him to look beneath and if he stands above close to the landing gear he can view the ground through the viewport. The plane had entered service decades ago and lighting was provided in the cabin by small incandescent lightbulbs. Bruce did the math and saw the savings more modern lighting technology would provide. He went for LED lights of course. The savings are massive. Bruce had to remove the passenger seats to make room for the things he needed. After he made all the modifications needed a section of passenger seats remained and Bruce decided to keep them. Call it nostalgia if you will but he truly enjoys the feeling of traveling when he sits there to read or enjoys something to drink. One of the things Bruce mentions repeatedly is how well designed are the electrical and water systems in these aircrafts. The security standards in these installations is a world appart from anything you’d find in a conventional home. 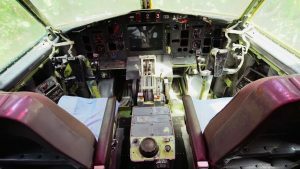 That is why he advices to those of you looking to follow his footsteps to acquire an aircraft that has not been dismantled in any way. Working with the plane’s electrical installation means you’d only have to connect the socket in the service bay with the electrical services using a service cable. The same goes for water. Bruce truly laments the rookie mistakes he made when he bought his Boeing 727. Many important components had been removed already and he realized the tremendous amount of time and effort he would have saved, had the plane been sold to him intact with only the engines removed. That is why he wants to get his next plane right off the runway and supervise the removal of the engines himself. Bruce doesn’t have many rules for visitors but one that he enforces energetically is no shoes onboard. He removes his own shoes at the entrance of the plane right by the door and replaces them with sleepers that are only worn inside. That way no dirt enters the airplane. Bruce kept the entire fuselage intact and the whole place is airtight. Dirt can only enter from the outside when people bring it on their shoes, hence the rule. We couldn’t help noticing that Bruce spends quite a lot of time in Japan nowadays. Maybe this has some bearing in his decision but no one can deny it’s perfectly sensible, particularly considering he installed plexiglass flooring all around. Luxury, though entirely possible, was far from Bruce’s mind when he decided to live in a retired airliner. He is a man that enjoys working with his hands -mostly in electrical appliances if you judge the man by the contents of his workbench. He has all the essentials in his plane. Nothing superflous has been added and all the work he did himself. 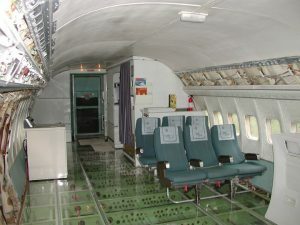 The Boeing 727-200 was configured -generally- with either two or three lavatories. These were located in the fore and aft of the aircraft. 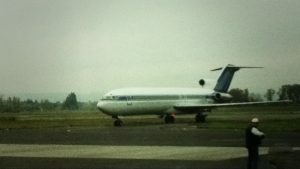 Bruce’s 727 came with three (one fore & two aft). All the lavatories have running water but the waste disposal connection is only installed for the bathrooms in the rear and his shower (That he designed and made himself). When Bruce received the plane most of the instruments in the cockpit were gone. He made it a mission to restore these items to give the cockpit a better look. So far he’s succeded in restoring about 30% but it is a work in progress. Jetliners nowadays have a cockpit with a crew of 2 but back in the day where this craft was in service there was a third member particularly in long-range airplanes such as this one. This member was the flight engineer and his duty was to keep all systems going smoothly. There’s a LED flatscreen that is not an original component of the cockpit (flatscreens were mostly science fiction gadgets back then) it was installed by Bruce who enjoys watching TV and reading here. Bruce has a workstation with a large monitor where he sends his emails. 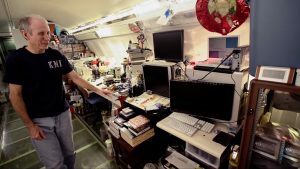 His workbench is not far off and is cluttered with electronic devices he tinkers with -as I’m sure many electrical engineers do on their free time. 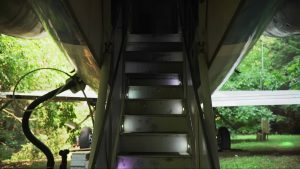 We already mentioned Bruce replaced the old incandescent lights with modern LEDs that draw a fraction of the power and produce virtually no heat, but we neglected to mention the exterior lights. All the lights on the plane are operational and the external lights remain as powerful as when the plane was in service. Another definitive advantage of keeping the original installation is that if there is ever a power shortage, all the lights will continue to function just the same. 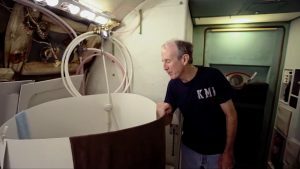 Bruce also built the running water system that supplies the craft. It’s basically a hydraulic pump connected to a service hose that he bought from the people who sold him the plane. 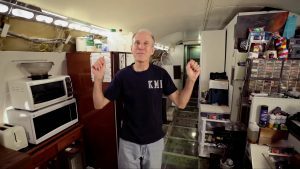 Bruce brags about the quality of the water in his plane. It comes from an underground spring and according to him it’s superb. Bruce likes to keep it simple in the kitchen. He has a microwave oven, and a toaster. He cooks simple food mostly. He’s stocked with food that would last him several months. 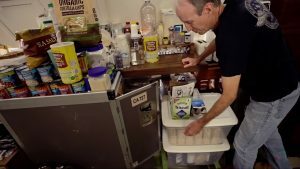 Bruce has a small laundry section equipped with a top-loading washing machine. It’s close to the shower and the toilets, no doubt to make use of the drainage installation of the aft toilets. Ths sources for this article, appart from Bruce’s site, include The Mirror, Icepop, The Daily Mail and Business Insider.